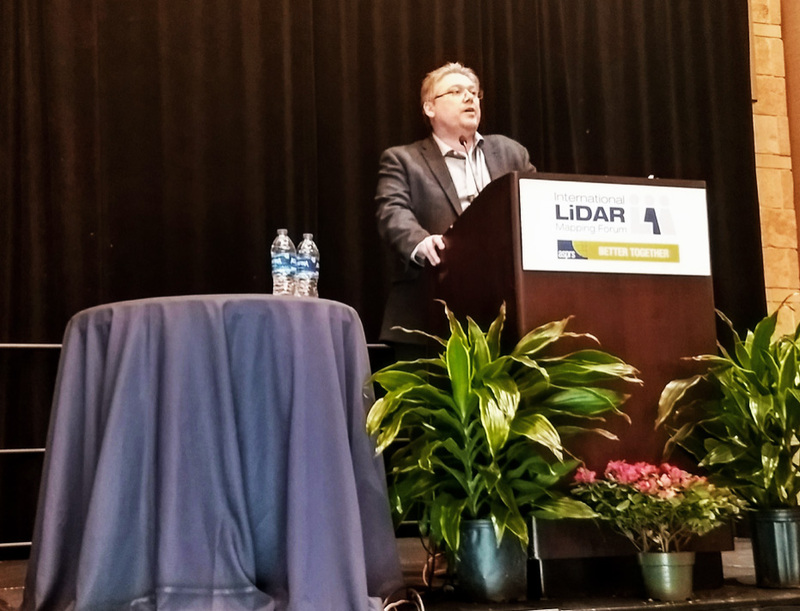 Sumac presents on the true return on investment of UAV surveys at the industry’s leading lidar conference - Sumac Geomatics Inc.
At the beginning of February, Sumac’s Todd Domney and Adam Bozcek presented at the International Lidar Mapping Forum (ILMF) in Denver, CO. In an industry so focussed on new platforms, sensors and accuracy figures; Sumac is keen to move the conversation on to show what the true value of UAV surveys are to the business processes that they support. Set in the context of customers in the natural resources sector who Sumac provides monthly reporting services to, Todd and Adam illustrated how Sumac’s UAV services influence the entire supply chain. The value of a stock pile held at a pulp and paper mill is typically much higher than in other industries. From a technical perspective, reasons for Sumac investing in a highly controlled semi-automated workflow as opposed to a fully automated data processing workflow were provided. With the results of volumetric reporting potentially having magnified knock-on effects to both the firm’s bottom line and supply chain, it is important to forensically investigate reasons for any error in results and clarify whether these were due to the survey methodology or issues in the production process on site. This impact of Sumac’s presentation was even picked-up by leading UAV industry analyst, Colin Snow (aka DroneAnalyst) in his recent piece predicting UAV industry trends in 2018. The team at Sumac are strong believers in implementing solutions that bring overall efficiencies, rather than implementing new technology for new technology’s sake. Sumac also recognises how important it is to be realistic about the capabilities of new systems. A technology in the UAV survey industry that creates much interest is lidar. Light detection and ranging (lidar) technology has been deployed for decades from manned systems for collecting 3D survey data, but the technology’s use from unmanned platforms continues to evolve. As the technology evolves, so does understanding capabilities, differences in understanding occur in the types of projects where it provides the most return on investment for the end client, in addition to the types of accuracies that can be realistically met on those projects. As the technologies used on UAV lidar systems have continued to evolve though, many of the systems have used components such as laser scanners, that were originally designed for industries other than survey purposes. Even though lidar and laser scanning technologies bring a reputation and perception for high-precision use, not all lidar systems collect data of the same characteristics. Indeed, in Sumac’s experience, equal if not better results can be achieved using a professional photogrammetric workflow on projects that originally requested lidar. At ILMF it was good to see the emergence of an increased number of highly integrated UAV lidar solutions that from the outset have been better designed for airborne survey operations. Examples of the new systems on display included Microdrones’ mdLIDAR1000 and Delair’s DT26X Lidar. Not only are we seeing increasingly higher-grade inertial navigation systems being deployed, we are also seeing lidar sensors being used that are purposely designed to only collect data below the aircraft. After all, why would you want to collect data of the sky? Sumac will be closely following the types of projects where these systems are deployed. What was pleasing to hear in the marketing of these systems were the increasingly realistic accuracy measures described for these high-end systems. While so often accuracy budgets are requested that fall below a commonly cited surveyor’s accuracy of 2 inches or 5 cm, both systems were specified as providing absolute accuracies of 6cm or ‘down to 5cm’, respectively under certain conditions. From Sumac’s experiences these are much more in line with what can be reliably achieved using these technologies and look forward seeing projects undertaken with UAV technologies being focussed on collecting data that provides value to the business processes that are being undertaken.